Learning to write a research paper is not that difficult with the right homeschool curriculum. If your student is college bound, then it is wise to teach him how to write a research paper during his homeschool high school years. We listed these research paper writing courses in order of difficulty starting with the more gentle approach in Susan Kemmerer’s Research in Increments. I don’t know why most students balk doing a research paper. If it is done step by step on an interesting topic, your student may learn to love doing research. 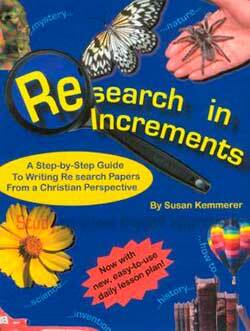 Research in Increments is a guide to how to write research papers. It breaks the researching writing process into small steps. Best of all the research skills are presented from a Christian perspective. Writing a Research Paper is designed to guide high school students through the process of writing a research paper–from selecting a topic to publishing the final draft. Writing from Research covers the process of research writing. How to document printed and electronic sources.